assessments, and online tests and exams in one tool. 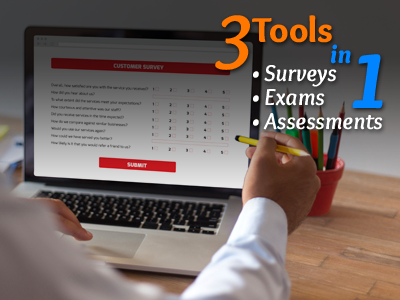 In addition to offering 3 advanced tools in one, Assess provides features and support services you will not get with any common mass market survey, testing, or assessment tool. We offer many unique and customized features as well as prompt, personal support and guidance from development to delivery to reporting and everything in between. And we are always open to adding new features and capabilities to accommodate your individual needs. Just a couple reasons why our users stay with Assess year after year. Since 2002 we have successfully met the needs of a broad variety of customers including Fortune 500 companies, small businesses, churches, hospitals, government, not-for-profits, universities, and others. All the Assess tools can be easily integrated with your database, website, shopping cart, or other e-commerce site. And all Assess tools offer comprehensive step-by-step help and reporting capabilities. We also offer assessment, survey, and test development, maintenance, reporting, and support services to companies who have the need but not the time, expertise, or internal support to do it themselves. Open your own online school. You provide the content. We provide the platform. (Real estate schools are our specialty.) Learn more. The survey tool collects and reports results from respondants with a variety of immediate and up-to-the-minute results and provides a powerful query tool for filtering your results, so you can report as much or as little of your results as you want in as much or as little detail as you want. With the assessment tool you can quickly and easily create and deliver online personal/individual and multi-rater (such as 360) assessments based on your own particular scoring schemes. Choose from and display a wide variety of assessment taker results reporting features. Assess even supports multiple language assessments. The testing tool enables you to build self-scoring exams and tests for such applications as pre and post training evaluations, skills and knowledge testing, and quizzes and exams for your online training modules. Set up your exams to be completely self administered, so there is minimal administrative time or effort required by you. Assess is available on an annual subscription fee basis for unlimited use. Please contact us for more information or to request a free demo. ©Copyright 1996-2019 Assess | Design and Hosting by Richmond's Biznet Internet Services Inc.